The Prescriber Monitored Supply System is designed to provide patients access to AndroFeme hormone cream under the supervision of their physician. 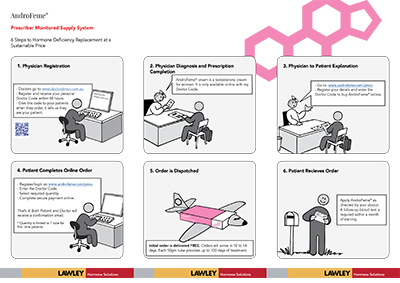 The Prescriber Monitored Supply System (PMSS) is summarized in this downloadable brochure. On going to www.androfeme.com/pmss the patient will Sign In and it is at this point they must enter the Dr’s code. This identifies to us that they are your patient. It also flags if they are a first-time patient and the shipping fee is waived. The patient orders from cart page and pays at the checkout. Both the physician and patient receives a confirmation email that an order has been placed, including the quantity ordered. Patients can only order a single tube to commence treatment. The first order will automatically be freight free. With second and subsequent orders patients are able to order up to five tubes and will be charged freight. Physicians will be sent an email each time a patient has ordered. This will include the quantity ordered. If at any time the physician requires the patient to be cut-off from future supply we need to notified and it will actioned immediately.